There is a legend passed down from the ancient world of the 1980's about a series of cartoons most foul. A series that is mocked and ridiculed by all who watch it. A series that attempts to follow the source material in some aspects, but completely deviate from it in other. It is a series so heinous that it has most likely doomed the franchise from ever being seriously considered to appear on television again. I am, of course, talking about The Legend of Zelda. The 80's were a strange time to be alive and I'm not entirely certain whether or not I'm happy that I was too young to remember most of it. It was only during that special and weird time that some of the stranger, darker, and more amazing shows and movies for children were produced. This would definitely fall in the "stranger" category. 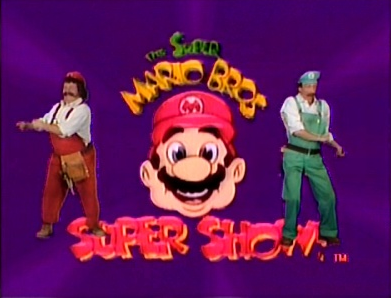 Towards the end of this decade came a little show called The Super Mario Bros Super Show which depicted Nintendo's Mario and Luigi characters in real life. The Mario Brothers would basically bumble about and meet celebrity guests. The middle segment of the show was dedicated to a 15-minute Super Mario Bros cartoon. 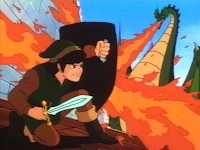 However, every Friday from Sept 8, 1989 to Dec 1, 1989, a Legend of Zelda cartoon was played instead. 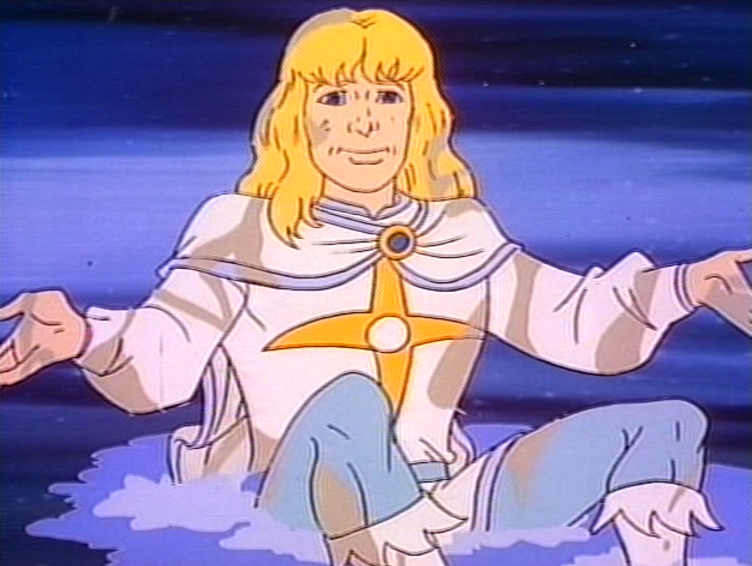 I had actually heard of this cartoon's existence, though mostly due to the "Well excuuuuuse me, princess" comments that fellow nerds would make. However, I had never actually seen the show until October 2016. I was walking around my local FYE and happened to see the entire 13 episode series for 6 dollars and grabbed it for a friend's Christmas package. Instead of sending it unopened, I watched the series first and it was just too...uh... interesting not to actually review. So let's grab our swords and magic boomerangs and see what The Legend of Zelda has to offer! 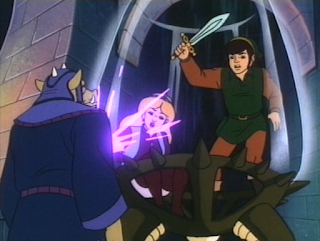 The young hero Link is now living in Hyrule Castle with Princess Zelda, King Harkinian, and a fairy named Spryte. 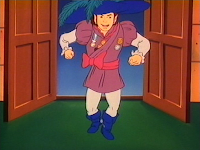 He has been employed by the royal family to protect Zelda and the Triforce of Wisdom from the evil sorcerer Ganon. Ganon, who resides in the Underworld, is currently in possession of the Triforce of Power and desires to take over the world. If either party obtains both of the Triforces they will have ultimate power in all of the land. The majority of episodes are very formulaic and generally involve something going on in the castle. It is then that Ganon initiates a plan to steal the Triforce. Ultimately Link and Zelda will then have to travel to the Underworld in order to stop Ganon and his minions. That's honestly about it. 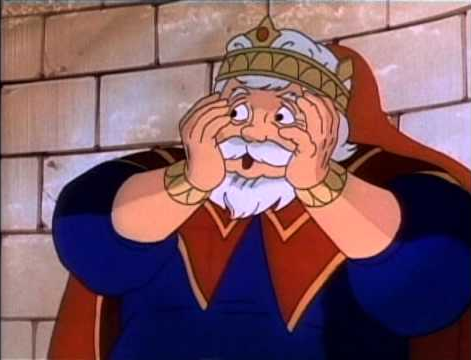 The episodes aren't exactly the same as Ganon will use different tactics as well as call upon minions and boss characters from the original Legend of Zelda and Zelda II games. That being said, the main plot and ideas of the show re-appear from episode to episode. Almost every episode can be summed up by the previous paragraph. 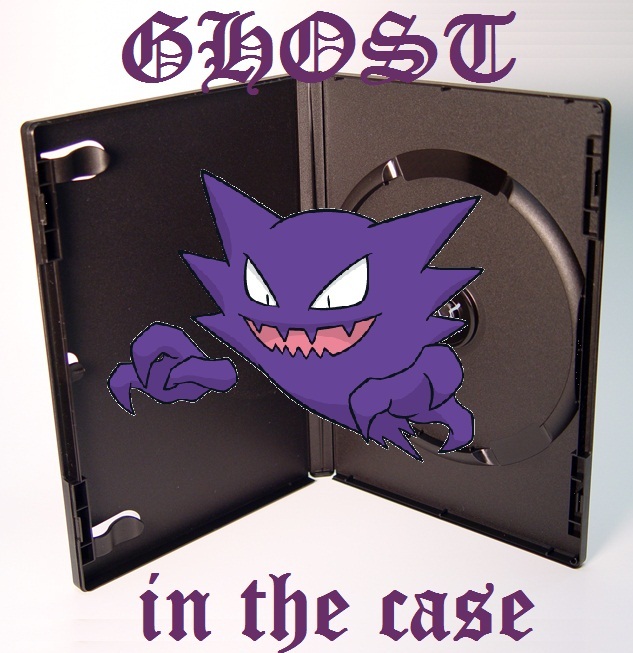 There are a couple episodes that break that format but I'll talk about them later. Zelda isn't just a damsel in distress. 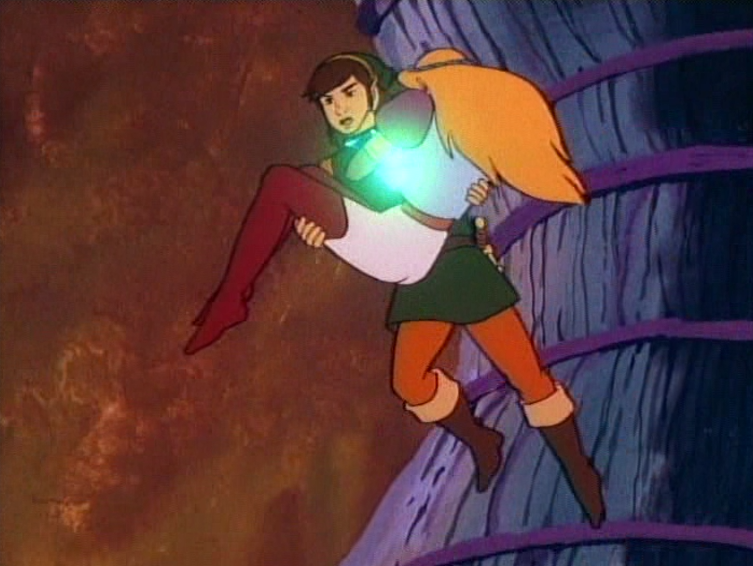 She's not necessarily the true hero as Link does occasionally have to rescue her and she does tend to scream a lot, but she does play an active role in the adventures of the episode. In almost every episode, she accompanies Link into the Underworld. 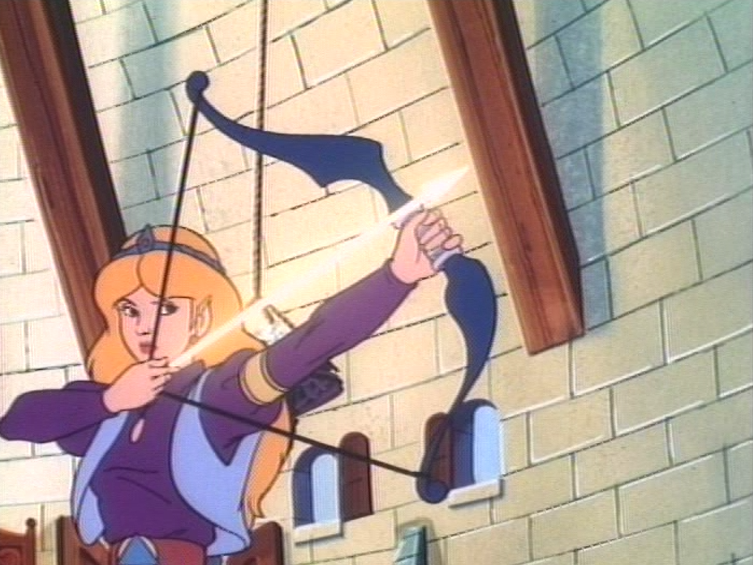 She will also fight off the villains using magic from the Triforce of Wisdom as well as magic boomerangs and crossbows. In fact, once or twice it her her decision to face Ganon and Link has to trail behind her. She's a far more progressive Zelda than we will see in the games till Ocarina of Time shows up in 1998. She's not quite "Zelda" and I'll get to that in the next section, but it's always great to see Zelda being more than a prize or quest goal. While the show is extremely formulaic, there are two episodes that break the mold. These episodes would be "Fairies in the Spring" and "The Moblins are Revolting." During all of the other episodes, the same sort of events take place where Ganon causes trouble or sends minions to steal the Triforce and Link/Zelda stop the plan. "Fairies in the Spring" revolves around the King wanting to make a water park (yes it's stupid) and water monsters begin attacking the workers. The water monsters turn out to actually be fairies scaring off the people because the water park was draining the Fairy Spring nearby. Ganon is not seen in this episode at all. "The Moblins are Revolting" is about Ganon's minions deciding to mutiny. They toss Ganon down a bottomless pit and take on Hyrule Castle themselves. Despite their best efforts, they are simply too inept without his leadership to actually do anything other than destroy each other. They aren't amazing episodes or anything but it's nice to see them do something a little more unique with the show. The overall quality of the show is... honestly bad. While the animation isn't terrible, there are many other aspects that cause the show to fail. The voice acting isn't that good, the writing is cliche and tired, and the plot recycles itself in almost every single episode. We're talking 11 out of 13 episodes are incredibly similar to each other, not in feel but in the general actions. There is also a multitude of examples where the show just flat doesn't make sense at all even in the world they built. 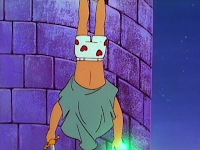 For example, there is an episode where Hyrule Castle gets tossed into the Underworld. Link and Zelda then find a stairway to the Underworld to save the King and the others. They confront Ganon and defeat him causing the machine which kept Hyule Castle below ground to reverse. Zelda attempts to get the Triforce of Power and stop Ganon for good. 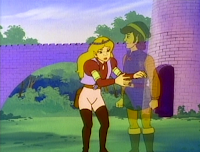 Instead of doing this, Link states that there isn't time, picks up Zelda, and hops into the Castle to return to Hyrule. One question here... HOW IS THERE NO TIME?? The show clearly has staircases to the Underground littered all over Hyrule so that anyone can just waltz to and from the place freely. Why didn't they just grab the Triforce and head back the way they originally came? I realize that would have ended the show before its time, and I realize it's only a fifteen minute cartoon for kids but a little extra effort would have gone a very long way. 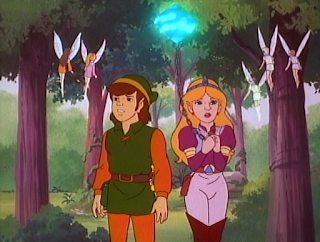 While Link and Zelda are present in the show, these characters are not Link or Zelda. Now, I do fully understand that in 1989 they didn't exactly have an exhaustive list of games to pull characterizations from. I am making these observations from 30 years after the original game and possibly have a clearer understanding of what these characters should be like than the creators would have at the time. That said, I'm fairly certain that turning Link and Zelda into stereotypical 80's kids with attitude was never a good idea. 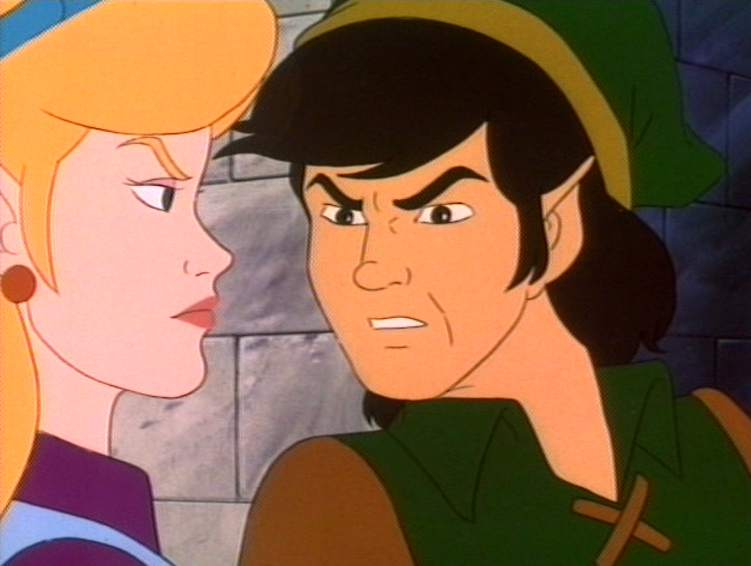 Link is a fairly lazy, hormone driven knuckle head who constantly tries to get Zelda to kiss him and incessantly shouts his catchphrase of "well, excuuuuse me, princess." We get the "pleasure" of hearing that a LOT as he shouts it 29 times in 13 episodes. Zelda is more of a low-key valley girl in this instance... sort of. She's harder for me to describe really outside of stereotypical 80's girl but without gadgets and big hair. I don't know, she's not too awful but she certainly doesn't give off that Princess of Hyrule vibe. You want to know when I realized that these cartoons were as bad as everyone said? It was as early as episode two. I try to give a show the benefit of a doubt with the first episode as first episodes are hard. Writers and actors are coming in to this brand new so I try to give more than one episode of a show just to see how well they can grow into the series. Sadly, when Episode 2 was finished, I knew it was hopeless. In "Cold Spells" Ganon causes mischief and actually gets his hands on the Triforce of Wisdom. He then takes it to the Underworld and has both of the triforces completely in his possession. According to the show, that would give him ultimate power. Instead of giving him ultimate power it basically does nothing as Link shows up, shoots Ganon twice with his magic sword and kills him. I don't mean wound, I mean kill him because he disappears completely just like characters do in the game when they die. Zelda somehow has time to nab her triforce but not Ganon's literally feet away, then for the ending scene it is revealed that Ganon is not actually dead. Instead he's stuck in a jar of evil and will most likely be out for the next episode ....WHAT? So you're telling me Ganon won. He got ultimate power but the ultimate power did absolutely nothing and then he died but "lol jk not really" so that he could come back next episode? Yeah that's when I knew exactly the level of bad I was in for. Here's a short list of funny or interesting things in the episodes. Link wears this outfit to impress Zelda. 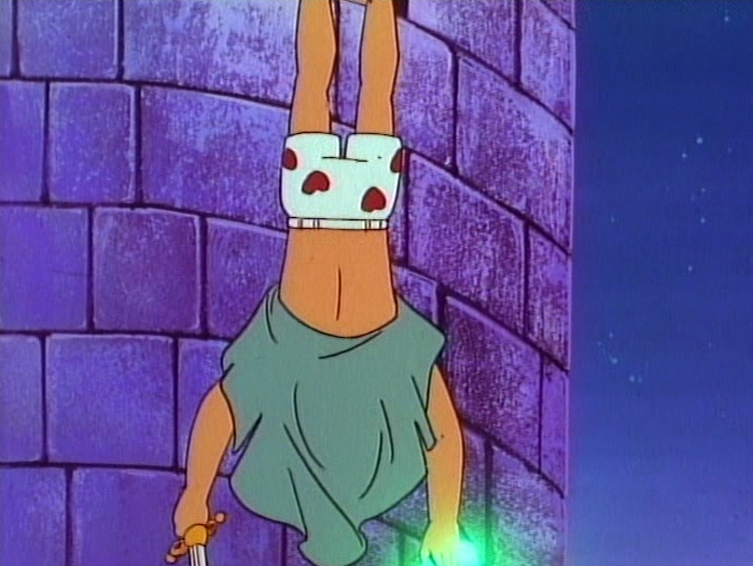 Link apparently wears heart covered boxers? In one episode, Link's body is taken to the Underworld but his spirit is stuck behind. Only Zelda can see him. Whether they did this intentionally or not, this idea was basically re-created in opposite for The Legend of Zelda: Spirit Tracks 20 years later. During that game, Zelda's spirit leaves her body and only Link can see her. There is no mention of the Triforce of Courage which Link possesses. I'm not sure if this was an oversight or if the Triforce of Courage didn't exist in the lore of the games in 1989.... and yes I'm too lazy to look it up. Link makes the following statement about Zelda. "She's not worth rescuing but I'm doing it anyway." I really hate saying that something is truly bad in my conclusions. Any film or TV series is a miniature miracle that it even exists with all the hoops you have to jump through in order to get it on the screen. However, the truth of the matter is, the Legend of Zelda cartoon series is bad... really bad. It's cliche, dated, annoying, and incredibly predictable. The jokes are rarely funny and the writing just comes across as rushed and amateur. That being said I am truly glad that I watched it. It's bad but it's an amazingly enjoyable bad. I guess you could say it's a real guilty pleasure. I can see how bad it is, and I was cringing the majority of the time... but I kept watching and wanted to see the thing in its entirety. I had fun. So if you're looking for some Legend of Zelda to watch and don't mind something being enjoyable but terrible then I'd honestly suggest that you check out these 13 episodes. Heck, you can find the first episode on Youtube. It's only 15 minutes, give it a watch so you too can see the... interesting spectacle that is this trainwreck of a show. I'm certainly glad I did.